"Today we want to welcome JUMPSUSA as our official Arena Sponsor for RideAbility Therapeutic Riding Center. Working with Children and Adults with Special needs and SPECIAL TALENTS. Jumps USA has partnered with our Center to donate new poles and arena equipment to make RideAbility a beautiful, and educational arena for our riders. We are proud to call them our sponsors. 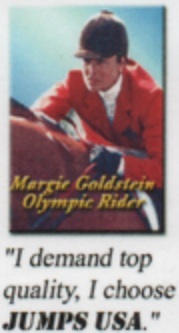 Thank you JUMPSUSA for helping our riders succeed." "My name is Christa Gandolfo and I am a three star event rider and owner of a new, premiere training facility in Ocala, FL called Oakmont. JumpsUSA's jumps and dressage arenas are the most professional and manageable equipment I have come across. The equipment makes any arena/facility look extremely professional at the same time as being lightweight, durable and easy to move unlike those big, heavy, wooden standards! I wouldn't choose to use anything other than JumpsUSA equipment! 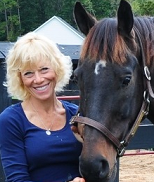 As head trainer and course designer at Walders Way Equestrian Center my students and their horses demand the best in training and facilities. When I saw the Grand Prix jump package offered from Jumps USA it appeared to be the perfect combination of appearance, quality and price. My jumpers face jump courses that include liverpools, roll tops, Swedish, Oxers, walls and varied standards all in 6 foot heights. Jumps USA had all these variations covered with the jumps weighing 1/5 of their wooden counter parts. Since I change the courses for my students at least 2 times per week in both indoor and outdoor arenas the ease of jump resetting is paramount. In addition when we travel from our home barn located in PA to our winter facility in Wellington our jump course travels with us. It packs easily in a small 2 horses trailer and sets up in less than one hour! We simply don't leave home without them! We have had our current jumps for over 3 years, they are constantly used and face all types of weather conditions and today have only minor signs of use, their wooden counterparts would have needed to be refunished, repaired or replaced by now. 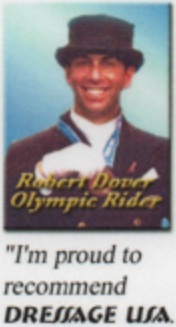 From our ponies to Grand Prix jumpers, Jumps USA is the only jump that meets our vigorous standards!" *07.28.2012 Official Jumps Supplier of the International FEI TROPHEES du 114. * Lipizzaner Stallion Show Official Supplier. * 2000 Hits Circuit - Winter Circuit - Desert Circuit , Official Supplier. 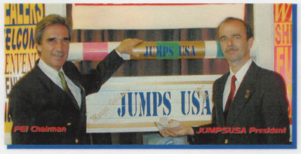 "JUMPS USA the best product on the market"
" I use only the Best, JUMPSUSA. " " JUMPSUSA Products are what i have always wanted, Safe, Good Looking and Practical. I recommend them. " "I am very impressed with the quality of the products manufactured by JUMPSUSA. The Jumps are very solid and secure yet light enough to easily move. 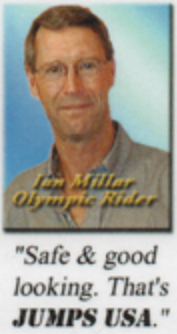 I am pleased to be associated with JUMPSUSA and highly recommend their jumps." 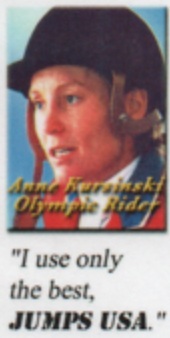 " I am Proud to recommend JUMPSUSA Dressage Arenas. "